Stay in-the-loop as La Foret gets better and better! Wow! 2017 has already been a BIG year of improvements for the buildings and grounds of La Foret! We care so much about La Foret, our team has been working very hard already this year, giving camp the attention and updates needed. We are so proud to show you all the great work, and for you to be able to experience it at your next trip to La Foret. Grant money to restore and preserve. Shop Extension New four-bay shop extension. Lower Dining Hall Updating the basement to be used for group space. Recreation Area & Meadow New sports equipment and improvements to recreation. Scroll down to read more about each project, to see before/after photos, progress, and final products! 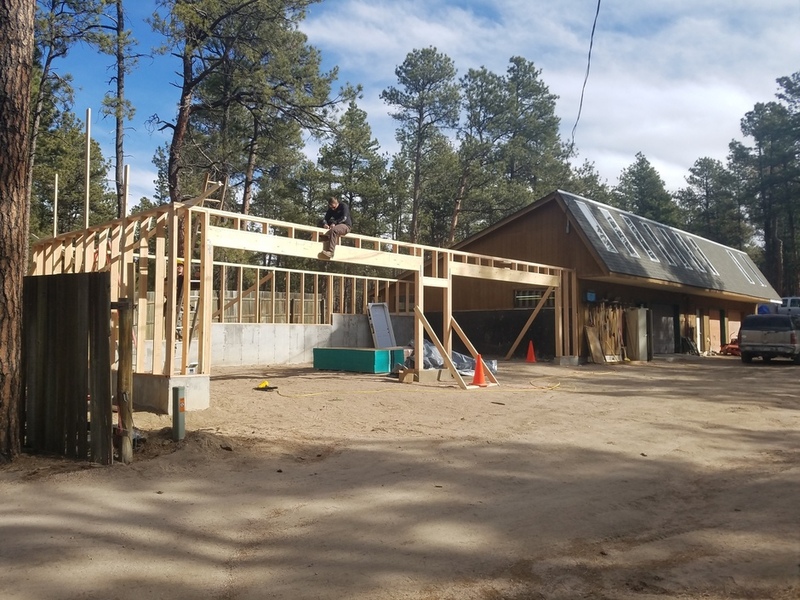 Ponderosa's Restoration Project is Underway! 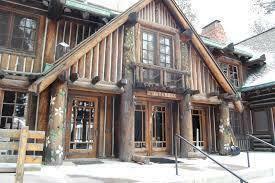 had been selected to receive a grant for the restoration of the Ponderosa Lodge! The grant is a matching grant from the State Historical Fund, ($200k them, $83k us). These grants are given for requested projects to preserve, rehabilitate, or purchase properties that are of historical significance. Most of the properties are on the National or State Historic register. Ponderosa Lodge is on both! The idea is to make it last another 90 years. 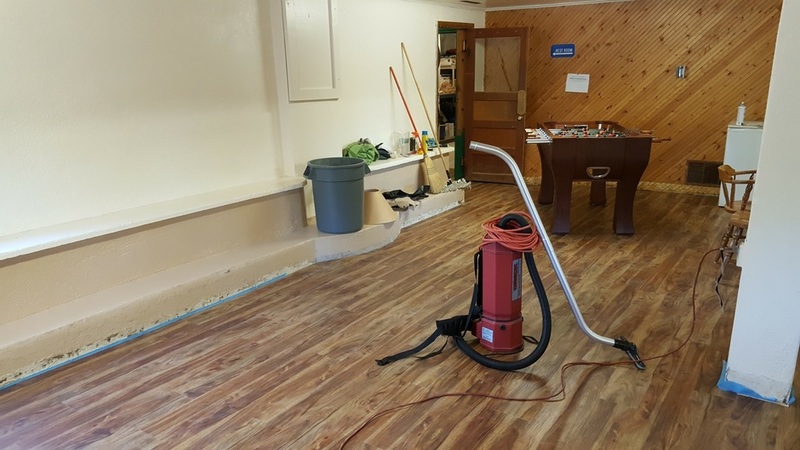 The $200,000 along with our required matching money from La Foret of $83,000 will go specifically for site drainage, log construction repair, chimney repair, added roof drainage, and first floor rehabilitation. This was all spelled out in a budget within the application. The general purpose of this request was to rehabilitate previous water damage and to prevent further damage. The process for spending these funds is under a very strict and arduous budget process designed to meet standards for historic reconstruction and preservation. 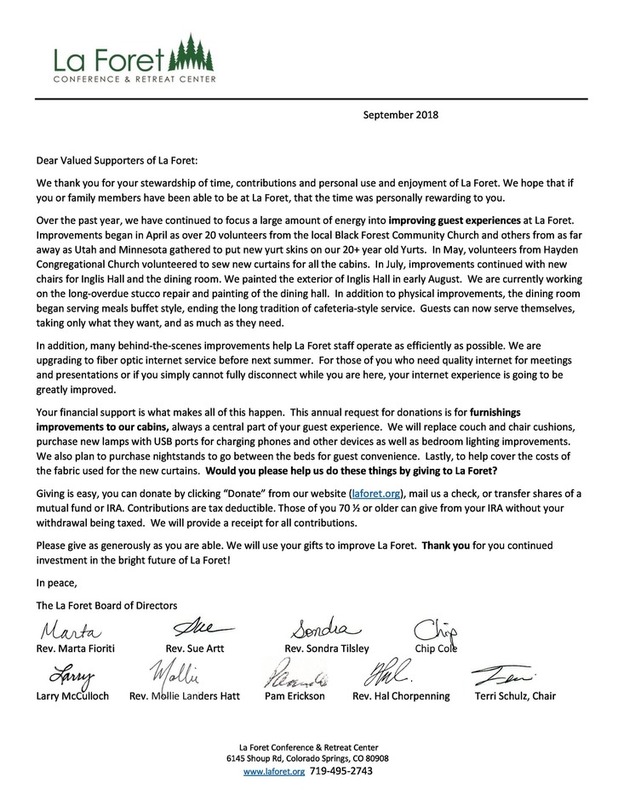 This grant will allow La Foret to continue its mission to provide a natural sanctuary to all guests to consider the transcendent issues in their group and individual lives. About half of the grant is from First Congregational Church Colorado Springs back in 2006**. -Floors are being taken up to excavate below the joists for moisture control. -New flooring is a resulting beneficial consequence. -We are redoing some of the plumbing. -The panels in the main room floor that rise in the summer are getting fixed. -Cracks in concrete are being fixed and missing bricks replaced. 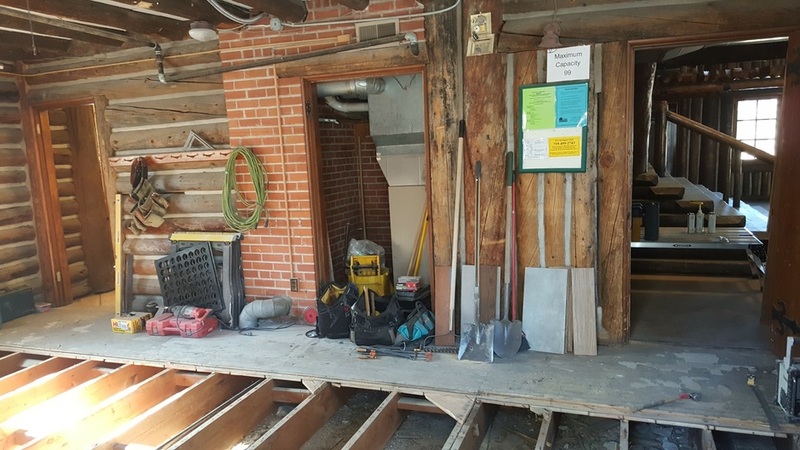 Ponderosa is only receiving structural improvements so it will be standing strong and stable for many years to come, though it will not look very different once complete. Adding on to the Shop! Our Buildings & Grounds Director, Tim Cole has knowledge and experience not only in building projects, but imagining and creating them as well! Tim as taken architecture and drafting courses to learn the fundamentals, and his experience in the field has taught him all the ins-and-outs of project development. Now, with this custom-made draw-up of a new four-bay addition to our shop is underway, thanks to the design Tim came up with. We are motivated to continue the care, upkeep, and improvements to our wonderful camp, La Foret. 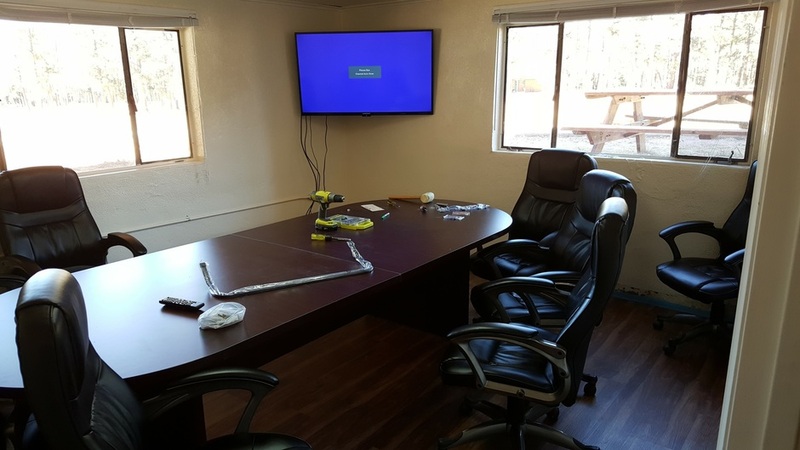 This extension to the shop will open up the space for the crew to work safely and comfortably. We will also gain much needed shelter for our utility vehicles and other important camp property to be stored. 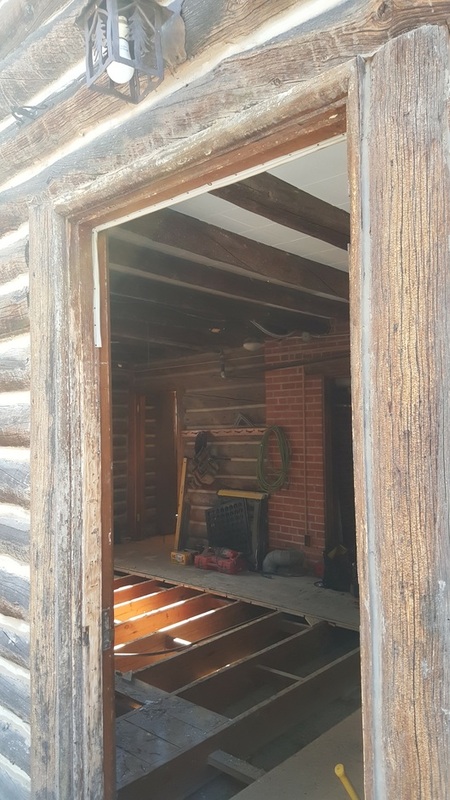 In fact, we will even be able to re-dedicate a portion of the shop to a woodworking area, where future La Foret-improvement plans will be able to come to life as well. 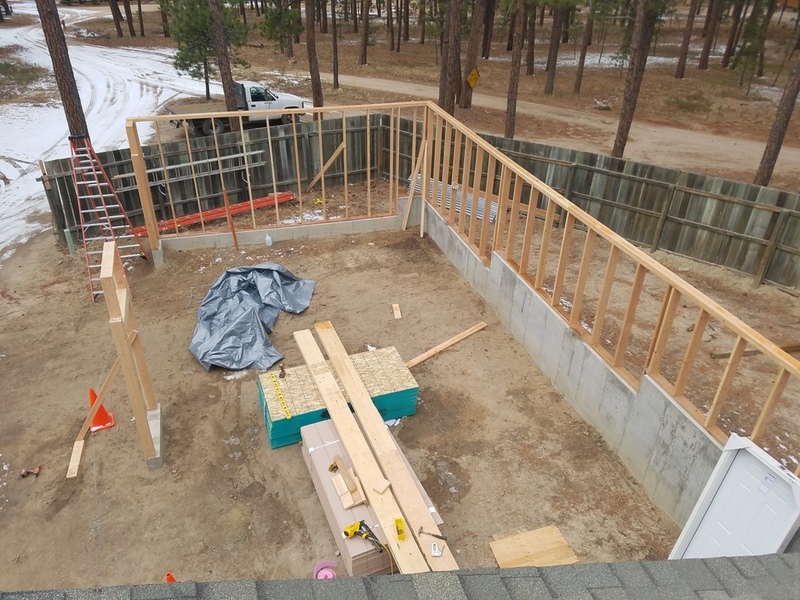 *Tim created this custom drafting plan to add on this four-bay extension to the workshop at La Foret! SO neat as it comes to life! Another impressive improvement is taking place in the basement of our dining hall. 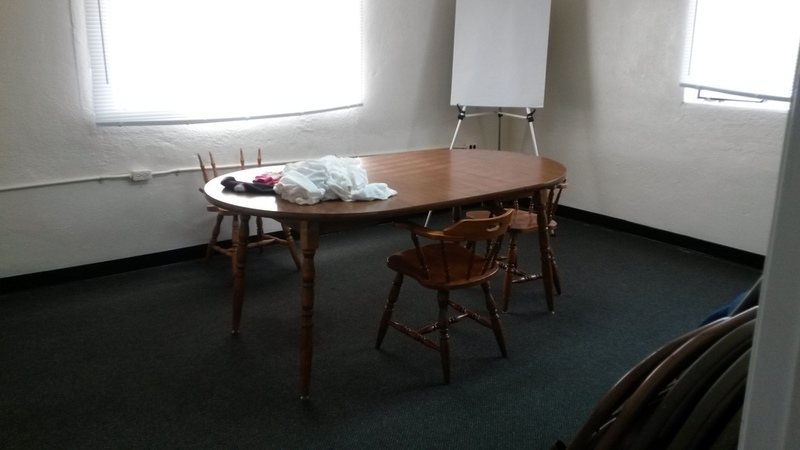 Dubbed the "Lower Dining Hall," this space has been used in the past as overflow or back-up space, not a readily-rented room. 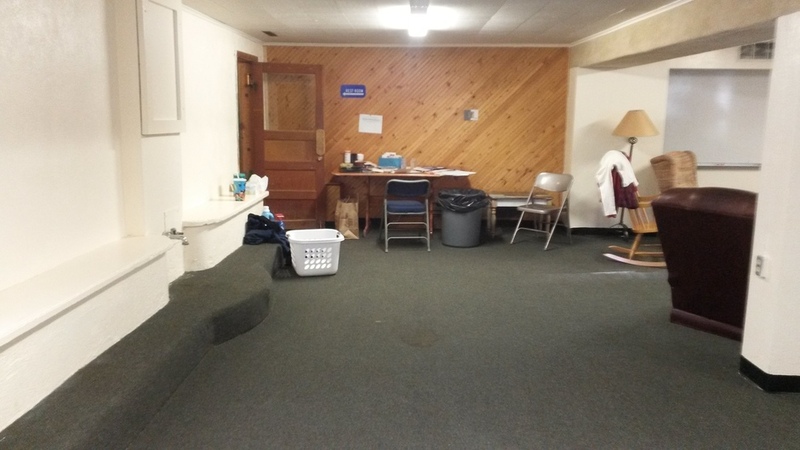 Now, it's transforming into a nice, clean, pretty space to use for many purposes!